In 2012/13, the federal government?s total transfers to the provinces amounted to $60.1 billion, or $1,725 per capita. 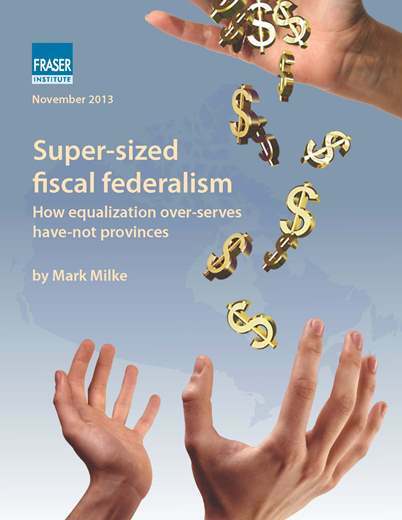 This study examines one of those federal transfer programs, equalization. Equalization is an unconditional transfer of federal funds to provinces eligible for such payments; eligibility is determined based upon calculations of ?fiscal capacity? (which is calculated based on a province?s ability to raise its own revenues). In total, from 2005/06 to 2012/13 (the period covered by this study), the federal government has transferred $107.5 billion in equalization, $4.6 billion in offshore agreement payments, and almost $2.2 billion in what is known as ?total transfer protection? (the latter two are kinds of ?equalization-plus? payments) to nine of Canada?s ten provinces. The ten provinces were categorized based on their status as ?giver? or ?taker?, this based, in essence, on those provinces that received little or no equalization payments on a relative per capita basis in the 2005/06-2012/13 period, and those that received substantial per capita sums. Then, nineteen indicators were surveyed including health and education as well as protection of persons and property and general government functions. While additional indicators are available, the indicators chosen represent service levels in program areas, two of which?health care and education?account for roughly two-thirds of provincial program spending. Thus, this group provides a reasonable reflection of several main provincial government spending priorities. The six ?have-not? provinces (Manitoba, Quebec, New Brunswick, Nova Scotia, Prince Edward Island, and Newfoundland & Labrador) possess the advantage in thirteen categories. The four ?have? provinces (British Columbia, Alberta, Saskatchewan, and Ontario) have an advantage in just three categories. Three categories are neutral, with no discernible advantage in have or have-not provinces. The data also reveal that: five of six ?taking? provinces show a larger government relative to the economy when compared to all ?giving? provinces. Quebec has a larger share of government than three of four giving provinces. In summary, in the have-not provinces, ?free? money offers choices to recipient provinces (when compared with the giving provinces) that otherwise would not be possible, from public sector staffing levels to government spending as a larger share of the economy. The receiving provinces have an advantage, at least in part, because of the additional money that flows from equalization.